A screen shot of the athletes' biography in the Olympic database. It does not show his name nor the country he represents. RIO DE JANEIRO, National record holder Carvin Nkanata could miss the Rio games after the International Olympic Committee, IOC reportedly ruled him ineligible to compete for Kenya in the 200m. Nkanata arrived in Rio early Thursday and was not even granted entry into the Olympic village as he lacked the proper identification needed to enter him as a valid Kenyan athlete for the Rio games that open on Friday. He is scheduled to race in the men’s 200m on August 17 and by late Thursday his name had been removed from the team Kenya listing in the Olympics database. The American born Kenyan who holds a personal best of 20.14 seconds, apparently did not have his accreditation card when he arrived at the village that was shipped by the team management to his base in Summersville city, South Carolina. However, he had not received it by the time he set off for Rio on Wednesday. He was only holding his American passport and the Kenyan National Identification which the organisers could not use to grant him access to the village. Sports News Arena has established that though Kenya legally allows dual citizenship the 25-year old had recently launched his application for the Kenyan passport which is still in process. Nkanata’s father is Kenyan while his mother is American. “We are working on this. We still have an opportunity to get him in. There is no need for worry,”assured the head of Kenyan delegation, Stephen Soi, certain the runner would join the rest of the sprinters who arrived in Rio last Sunday. The USA does not support dual citizenship as a matter of policy, but the country recognizes the existence of dual citizenship and allows multiple citizenship by its residents, which would apply in Nkanata’s case. 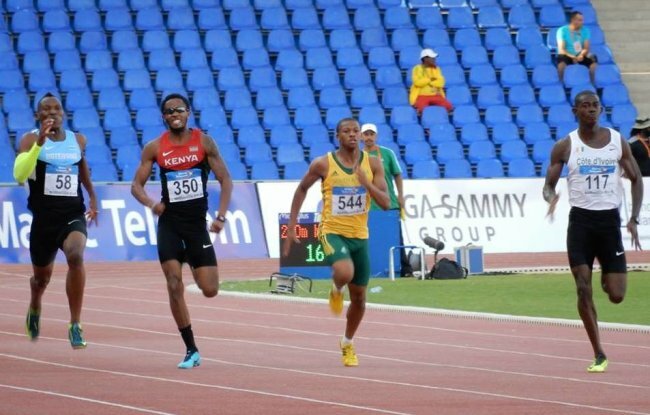 The 2014 African bronze medallist raced in the Kenyan Olympic trials in June which he won in 20.86. His season best is 20.46 seconds from the meet in Montverde, Florida where he finished third in his heat won by American Tyson Gay last June. Last year, he raced at the world championships in Beijing and reached the semi finals of the Commonwealth games in Glasgow in 2014, the same year he raced in the 4 by 200m at the world relays. His absence could leave Mike Moikamba, a two time world championships racer (Beijing and Moscow) as the only Kenyan in the 200m dash. “It is always good to have someone you can train with and having Carvin would have give me the morale boost, I hope he can make it,” said Moikamba, the 100m national record holder. “But anyway in racing it is always about you as you have your line and I have to keep focus. It is a big achievement for me as you know it takes four years to the next Olympics,” he added, pleased to be following in his father footsteps. Elkana Nyang’au, who is also his coached raced for the Kenya in the 1988 Olympics in the 4 by 100m. The senior Nyang’au was also part of the 4 by 400m relay team that won silver in the 1987 All Africa games in Nairobi. Moikamba considers he stands a good chance in his debut Olympics. He raced to his personal best of 20.38 last May in Nairobi. He has been dogged by a tendon injury that kept him off training for weeks and also weighed on him at the African championships.